Murwillumbah is a town in far north-eastern New South Wales, Australia in the Tweed Shire, on the Tweed River, 848 km north-east of Sydney, 13 km south of the Queensland border and 132 km south of Brisbane. At the 2011 census, Murwillumbah had a population of 8,523 people. The town's name is often abbreviated to M'bah or Murbah. Murwillumbah sits on the south eastern foothills of the McPherson Range in the Tweed Volcano valley. The area is hilly. Many of the buildings are Art Deco in style and there are cafes, clothes and antique shops in the town. 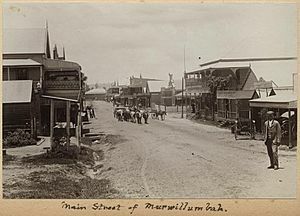 Murwillumbah is the eighth town mentioned in the original Australia version of the song "I've Been Everywhere". The area is used for filming of the British reality series, I'm A Celebrity... Get Me Out of Here!, and has been since 2002. Versions of the show for other countries are also produced in the area. Murwillumbah was also used as the location for the film Lou (2010) starring John Hurt. The ABC television series of the novel Pastures of the Blue Crane was also filmed in the Tweed region in 1969. The first people to live in the area were Bundjalung people. The name Murwillumbah derives from an Aboriginal word meaning "camping place" – from Murrie, meaning "aboriginal people", Wolli, "a camp"; and Bab, "the place of". Nearby Mount Warning and its attendant national park are known as Wollumbin, meaning "Cloud Catcher", in the Bundjalung language. Timber-getters were drawn to the region in the 1840s. The river port at Tumbulgum was initially the main settlement. In 1902, a local government municipality was declared with Murwillumbah as its centre. Most of the town's business district was destroyed by fire in 1907. Murwillumbah is the location for Australia’s largest-ever bank robbery which occurred in 1978 and has not been solved. Murwillumbah is protected by a series of levees, but they do not protect all parts of the town in major floods. The worst flood to hit the town occurred in February 1954, with another major flood in 1956. In 1974, 200 people were evacuated from the town after floodwater from Tropical Cyclone Zoe inundated the area. In January 2008, Murwillumbah and surrounding areas were hit by severe flooding. May 2009 saw more evacuations in the town and surrounds after heavy rainfall. The town was bypassed by the Pacific Highway in August 2002. Today, main road access from both north and south is via the scenic Tweed Valley Way, which was formerly a section of the original highway. There is an inland road that passes along the Numinbah Valley through the towns of Chillingham, Numinbah and Natural Bridge which is scenic tourist drive. Another major road west of the town heads to Kyogle via the town Uki, and also passes near the town of Nimbin. Murwillumbah station was the terminus of the Casino–Murwillumbah branch line, and had daily train services to Sydney until the line closed in 2004. Today, coaches to and from Casino provide connections to daily Countrylink trains servicing Sydney and the N.S.W. north coast. Murwillumbah Bus Company offers regular services to major parts of the town, as well as Condong and Uki. Parson's Bus Service offers services to Pottsville, Cabarita Beach, and Stokers Siding. Gosel's Bus Service offers services to Nimbin via Uki on route 630. Singh's Bus Service offers services to Chillingham, Tyalgum and Eungella. Surfside Bus Lines (NSW) offers hourly service to Tweed Heads via Terranora on route 605. Taxi services are also available. Murwillumbah's airfield, Whittle Field (ICAO code YMUR), is named after a noted local World War II Spitfire pilot, the late Bob Whittle. It has no scheduled services, but its 800-metre grass runway supports Murwillumbah Aero Club and business activities including crop-dusting, aircraft restoration, training and scenic charter flights. The annual Tweed Banana Festival, the second oldest festival in Australia is staged in the town. In 2005, the festival celebrated its 50th anniversary. Since 2002 an annual historic motor racing festival has been run through the streets of Murwillimbah, featuring a parade through town, a one kilometre hillclimb course, and connected events, attracting thousands of spectators. Modeled on the Goodwood Festival of Speed, Speed on Tweed was a highlight of the local calendar attracting cars and competitors from all over Australia and from Europe and North America. In September 2009 the event was held in conjunction with Rally Australia which has scheduled one special stage in Murwillumbah. In the 2011 census, Murwillumbah recorded a population of 6,342 people, 53.3% female and 46.7% male. The median age of the Murwillumbah population was 43 years, 6 years above the national median of 37. 84% of people living in Murwillumbah were born in Australia. The other top responses for country of birth were England 3.3%, New Zealand 1.8%, India 1%, Scotland 0.6%, Netherlands 0.5%. 92.4% of people spoke only English at home; the next most common languages were 1% Punjabi, 0.4% German, 0.3% Dutch, 0.3% Italian, 0.3% Spanish. Murwillumbah has numerous sports clubs including Murwillumbah Mustangs, Murwillumbah SC, The Gentleman of Murwillumbah Rugby Club, golf, rowing, cricket, lawn bowls and cycling. Murwillumbah Facts for Kids. Kiddle Encyclopedia.